Clive began his real estate career on Waiheke Island 23 years ago when he won the company New Zealand Rookie of the Year, and the following year exceeded that by winning the nationwide REINZ Rookie of the Year. Consistently a top performer in his field, Clive has achieved close to $300,000,000 in sales and his wide reaching personal database reflects his success. Clive has a personable and engaging approach with both vendors and purchasers which has won him many friends over the years, together with his no-nonsense and friendly attitude. 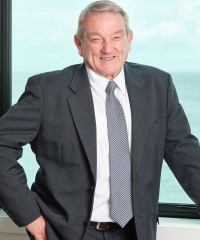 Having owned property on Waiheke for 48 years, Cliveâ€™s profile is far reaching and heâ€™s actively involved in the local community sponsoring numerous events. You may have heard of his son Dean Lonergan, a successful sports promoter. Clive is dedicated to his family and attends almost all of Deanâ€™s local and international sporting events. Clive has a particular talent for building rapport with both vendors and purchasers and has a strong after sales ethic and desire to go the extra mile. In his third year of partnering his business with Lisa Hopewell, they each bring their individual skill sets and experience and work in synergy with their Personal Assistant, Shakila Bell. As a team of three they have impressive resources and their aim is to exceed expectations of service. Clive specialises in residential, lifestyle blocks and waterfront properties and now proudly aligns his passion for marketing property with New Zealand Sothebyâ€™s International Realty.